If you’ve consumed any media on the gig economy during the last several years, you were probably seriously confused last Thursday. That’s when the Bureau of Labor Statistics (BLS) released its new survey data on contingent workers, which was much anticipated because the last time the survey was conducted was in 2005. Given the endless coverage of Uber and freelancing as paradigmatic of the 21st century labor market, expectations were that the new data would show significant increases in contingent work. But the 2017 results were counter-intuitive to many (above graph). 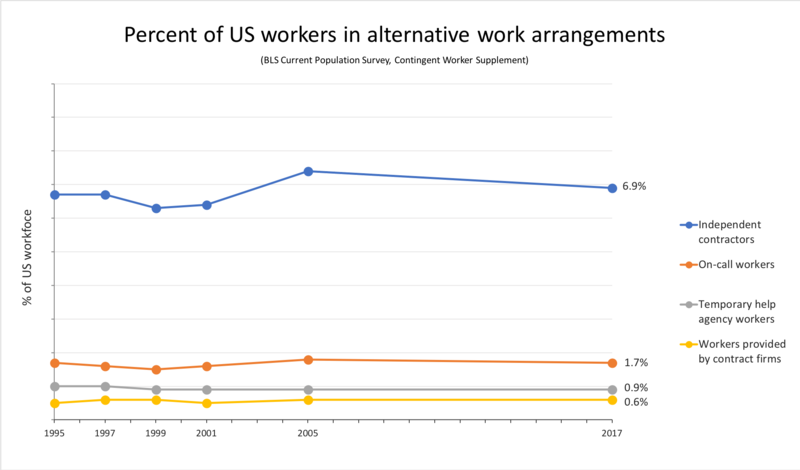 The BLS found little or no change in the percent of U.S. workers who are independent contractors, temp workers, contract workers, or on-call workers — what the BLS terms “alternative work arrangements” but what many think of as contingent. These four categories combined total just 10.1 percent of the workforce, certainly not the gig apocalypse often portrayed in the media. So what’s going on here? In what follows, I give my understanding based on research that I and others have done in this area. There’s both a geek component and a broader picture component; I’m starting with the geek part because it’s important to understanding the broader takeaway. Independent contractors are probably the group that people are most interested in, given the recent focus on gig platforms like Uber, Postmates, TaskRabbit and others that classify their workers as independent contractors. So how can it be that only 6.9 percent of workers fall into this category and that this percentage has barely moved over the past two decades? Here are two things to understand. First, this survey measures what workers were doing at their main job (the job where they worked the most hours). In fact, in this and other worker surveys, if you focus just on the main job that people are doing, it’s hard to find evidence of an explosion in independent contracting. A lot of these workers are what I think of as traditional independent contractors — everything from real estate agents, architects, and entertainers to hair stylists, family child care providers, and plumbers. What this survey is NOT picking up is workers who do independent contracting on the side, for supplemental income in addition to a W-2 job — think doing car repair for cash on the weekends or assembling Ikea products via TaskRabbit for ten hours a week. Unfortunately, it turns out that asking workers about this type of supplemental income is tough; there’s a lot of under-reporting in standard surveys. A rough estimate is that about 6 to 8 percent of workers supplement their W-2 job with independent contracting, based on new research that analyzes tax data. And many researchers think that this side-job activity has grown in recent years. If so, that would mean that independent contracting isn’t so much replacing W-2 jobs as making up for low wages, insufficient hours, or loss of earnings during spells of unemployment. At least for low-income workers, we may well be seeing the privatization of the safety net. Second, the category of “independent contractor” is much broader than the gig platform work that has been the focus of so much media attention. In fact, gig work like Uber driving is only a small subset. The BLS did not release its own estimates, but we have several good studies (such as this one) that put the number of workers using on-demand labor platforms at about 0.5 to 1.0 percent of the workforce. Moreover, research consistently finds that the majority of workers who use these platforms are doing so part time and for only part of the year. For more on independent contracting, I recommend this report (it focuses on California but has useful conceptual and empirical information demystifying gig work). Also surprising to many is that in the new BLS data, only 0.9 percent of workers report being employed by a temp agency. For those of us who track temp work, this result was actually consistent with other research. After growing in the early 1990s, temp work has since hovered around 2 percent of the workforce (this is higher than worker self-reports and is based on more accurate payroll data from employer surveys). What has changed, and strikingly so, is the industries that use temp workers, which today are concentrated in blue-collar sectors such as manufacturing and warehousing (see Figure 1 in this study). The BLS survey attempts to measure the size of the contracted workforce (estimated at 0.6 percent in 2017), but for this category I don’t think the survey is very useful. The phenomenon of firms contracting with other firms for goods and services has rightly received more attention of late, variously called subcontracting, fissuring, or domestic outsourcing. The problem is that the BLS survey asks about only one very specific version of subcontracted work: on-site at the client firm and typically only for one client. But many versions of subcontracted work are multi-client (think janitorial or IT contractors) or offsite (think call centers or industrial laundry workers). Even more important, these types of survey questions depend on workers being able to accurately identify their employer, which is very hard in the context of complex contracting arrangements between firms. I and other researchers think that subcontracting is actually a more important example of the changing nature of work in the US than gig work. But we have very few data sources that allow us to estimate the scale and effects of subcontracting; for a deep dive into the conceptual and research challenges, see this white paper. One of the important new areas of research and policy advocacy in the U.S. focuses on the increased use of unstable, just-in-time scheduling of workers in industries such as retail trade and restaurants, often enabled by new software platforms. However, the BLS question regarding on-call work is worded in such a way that it is unlikely to fully capture this phenomenon (the question is targeted at workers like substitute teachers and construction workers, whose jobs are structured to be on-call). The good news is that researchers have been analyzing other surveys, and they are documenting significant rates of unpredictable scheduling in key industries (see here and here). How does the new BLS report relate to other studies you’ve read about in the media? Two years ago, a much-cited study was released that estimated that almost all of the job growth in the U.S. since 2005 was in alternative work arrangements, accounting for 15.8 percent of the workforce in 2015. The problem is that this study, while attempting to replicate the BLS contingent worker questions, used an on-line survey given to a different and much smaller sample than the BLS survey and in the case of contract workers used a different measure (for more detailed analysis see this article). In light of these and other differences, I believe it is best to stick with the BLS time series. More generally, I want to communicate that the BLS contingent work data are not the final word and should be interpreted with care. Researchers are hard at work finding better ways to ask workers about their employment arrangements and mining other sources of data such as tax returns. In the heated gig economy debates, my touchstone is that the large majority of workers in the U.S. still have a W-2 job, including low-wage workers. The effects of growing inequality and loss of worker power are shared by workers in standard and nonstandard jobs alike — stagnant wages, lack of access to workplace benefits, insufficient hours, wage theft, retaliation when trying to organize. To be clear, I’m not saying that nothing has changed in the U.S. workplace. We absolutely have to understand how employers are reorganizing work and production and expand our public policy and organizing strategies as a result. But we have to base those strategies on a grounded and accurate analysis of exactly what is changing, how wages and other job outcomes are being affected, and how race, gender, and immigration status continue to fundamentally shape every corner of the U.S. labor market. Simply put, we need to stop running our future of work debates through the lens of Uber.